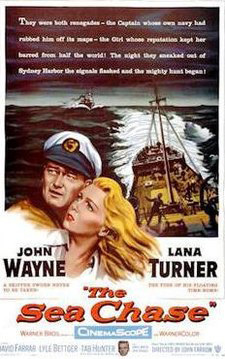 At the start of the Second World War, a German merchant marine captain (John Wayne) finds himself in Sydney Harbour, and facing internment for the duration of the conflict. He resolves to take his ship and crew surreptitiously out to sea, hoping to avoid British warships, and make his way back home. 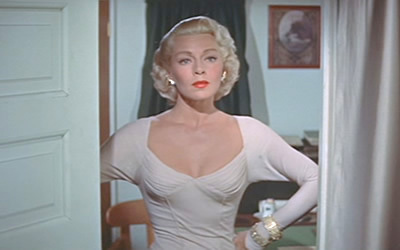 But his task is complicated by a spy (Lana Turner) he is ordered to take with him, and a first officer (Lyle Bettger) with an agenda of his own. This is both a different and similar sort of movie for Wayne. He has certainly played the same sort of person before: tough but fair, single-minded but tolerant, dedicated to a cause and to an ideal. But, except for his ill-advised role as Genghis Khan in the unlamented The Conqueror, this is, I believe, the only instance of Wayne portraying a non-American. I found it strange that, just ten years after the war, he was playing a German. His character is an anti-Nazi - he had been dismissed the German Navy due to his political views - but he is a patriot, determined to do his duty for his country. As if this were not strange enough for Wayne, his character retains a fondness for the old German Empire - or at least its Kriegsmarine - and has the imperial navy’s battle-flag framed on his cabin’s wall. I wonder how this role was sold to Wayne. Fortunately, neither he nor any of the others playing Germans adopt accents. (This doesn’t bother me; I assume that foreigners in movies talking amongst themselves are speaking their own language, and it is being ‘translated’ for the viewer.) This, in fact, helps make Wayne and the others’ performances more credible. Aside from the novelty of Wayne taking on the guise of a former American enemy - and making him sympathetic - The Sea Chase does not, unfortunately, have a great deal to recommend it. The story is standard fare. The romance between Wayne and Turner is predictable and lacklustre; there is no real chemistry between the two actors and there is no persuasive reason why their characters should find each other attractive, never mind fall in love. The story does not have much action, considering it is a John Wayne movie. I don’t need non-stop battle scenes to enjoy an adventure film but The Sea Chase was, at times, even boring. A good portion of the story is taken up on an uninhabited island where the ship’s crew must harvest wood as fuel, as they have no access to coal. This island is made the scene for personal conflict, but that isn’t exciting, either. The rest of the cast is capable but no one stretches their talents here. James Arness has a moderately significant role as a crewman, while a young - and blond - Claude Akins plays another sailor. David Farrar is the stalwart Royal Navy officer pursuing Wayne, his former friend, but, except for the opening conversations, his scenes may have been deleted all together without loss. Starting out with promise, The Sea Chase becomes almost mundane soon enough, and is for good reason not one of Wayne’s more memorable efforts, despite the unusual character he plays. 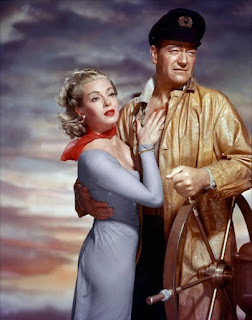 John Wayne as a German and Lana Turner as a spy. One does wonder how some of these movies get put together. This one doesn't sound as hilarious as "The Conqueror," though.